Yosemite is one of the most paradisiacal places in the world! If you do a quick search on the most beautiful places to see in California, this park is sure to be at the top of the list. And for me, it was “desire at first sight!” Those who know me well know that I am passionate about mountains, animals, green areas, trails and adventures. And nature did very well in that region, making Yosemite definitely my favorite place in California! During my cultural exchange in California, as a J1 participant, I had the opportunity to meet another beautiful little corner of this great country! I was always in love with American culture and knew that getting on the road and camping in rad places was super American. I had never been to a national park or camped in my life!! This would be the very first time. My host Family supported me on this idea and was excited for me to learn more about this part of their culture. They soon lent me their camping equipment and with two other friends (one American and one German), we went on a trip to this great adventure! Yosemite National Park is an incredible forest reserve where nature is lush, animals roam freely, there are deep valleys, waterfalls, a vast deserted area and more. The park is huge! We would have to stay there for a whole week to be able to explore further. Upon entering the park, there are many options for trails and activities. We received a map at the entrance telling a bit more of the history, trails and things to do in the park. The instructions for having a safe stay there were very clear. We had an amazing experience. The valley is very well preserved and the contact with nature is intense. The structure of the park is very well set up and even being in direct contact with nature, you can stay with comfort and security. We chose to camp, which is the cheapest and wonderful option! In addition to exploring the nature around us, I had the opportunity to connect even more with other Americans and foreigners who were also there. I was amazed to see the cultural diversity in that place! People from various countries and different corners of the United States were there ready to venture as well. We made a bonfire and sang around it with new friends who were near our tent, we did the traditional s’mores of course, cooked our food, we saw beautiful animals approaching, I saw a shooting star for the first time and much more!!! When asked about my trip to Yosemite, I find it rather difficult to find the right words to describe it. 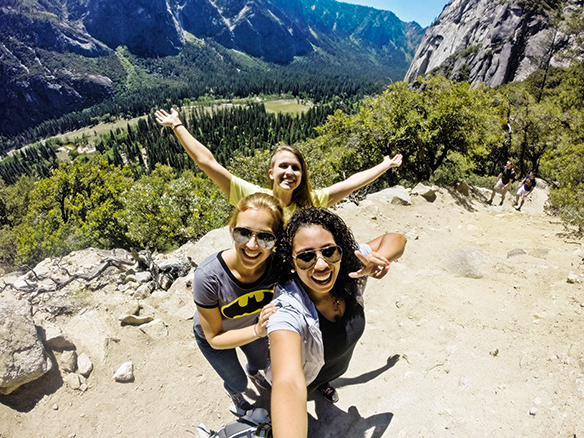 Yosemite is much more than a beautiful park, full of mountains and green. Yosemite Park is extraordinary, it’s huge, it’s magical. It’s the kind of place that charms you, sighing, dreaming awake. I can say without a doubt that it was one of the most beautiful places I have ever visited! I was struck by the tranquility and security I felt while I was there! I fell even more in love with nature and the simple life. Our lives in big cities, wedged between four walls and increasingly connected to the machines, distract us from such unforgettable and essential moments. Now living in Texas, again on the J1 visa, I’ve already found wonderful places to explore. I decided that the weekend before my birthday would have to be very special so I went to another US natural area, the Enchanted Rock! What an amazing place! I am super excited to see much more!! !